The flexible class concept is now spreading in Quebec and many schools that have not adopted it yet are questioning themselves. Is this a passing fad? Does it really work ? Should I have a « Pinterest » format flexible class ? There are different concepts attached to the flexible class, including reducing children’s inactivity. It is demonstrated that there is an increase in children’s inactivity around eight years old, as school, homework and technology take an important place in their life. Although the positive impact of physical activity has been present in scientific literature for a long time, school seems to be passive and sedentary. The flexible class, above all, allows students to choose the position in which they will listen, learn, work, etc. 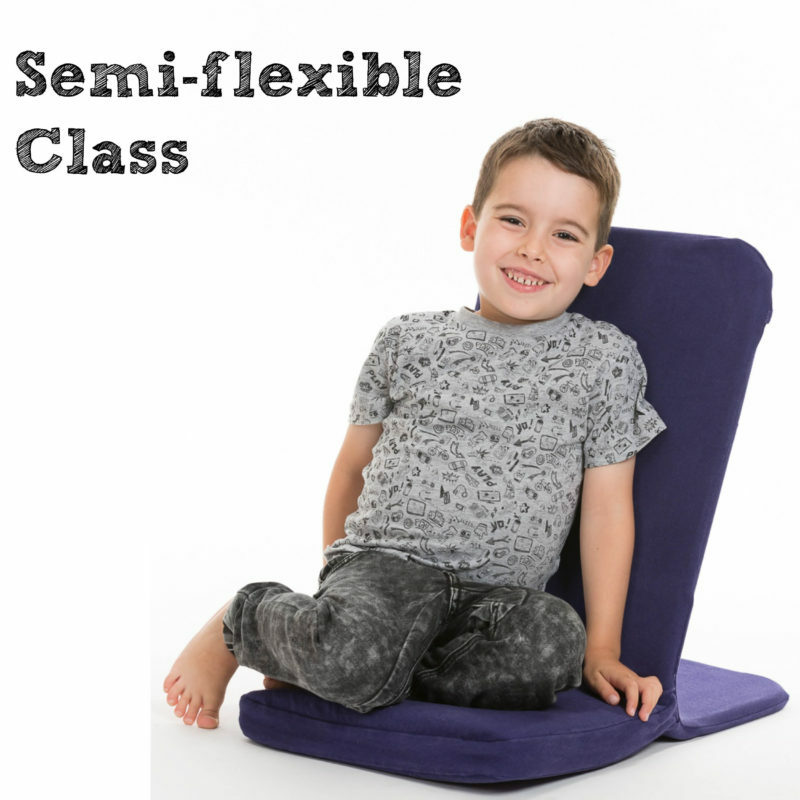 This way the flexible class will allow them to work in different positions through the day: lying on the ground, standing at a high table, on a stool allowing movement, kneeling, sitting on a ball, etc. The objective is to allow students to develop their selfregulating capabilities (sensory and emotional) in order to better manage their behaviour, attention and learning. Do I know about the benefits and the limits of the flexible setting, in terms of impact on the gross and fine motor development? Do I understand how the flexible setting will help my students to regulate themselves in a sensory way? Do I know how to use the different seatings and pieces of equipment (wobbling stools, air cushion, rebound elastic bands, etc.)? Is it possible to take out all desks and chairs from my class? Will the other classes in the school also make this change? If not, how will my students react when they will go from a flexible to a traditional class? What space is available to create working stations? Our experience shows that very little training is offered to teachers in order for them to make an informed choice with regards to flexible setting and to complete this transformation successfully. Furthermore the school budgets are limited in order to make these changes. It should also be noted that it proves difficult, if not impossible, to remove all desks and chairs from the class. 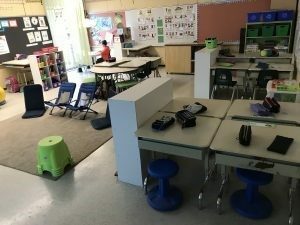 Finally, since the majority of the Quebec schools has not completely opted for the flexible class, students progress, according to their level, in classes partly flexible (including some working stations allowing to work in alternative positions and traditional desks), totally flexible or still traditional. Students going from a flexible to a traditional class may show some difficulty to readjust to a working environment that will not allow movement and selfregulation. This is why the ergotherapists on our team often discuss about the semi-flexible class option! We believe that the semi-flexible class is a compromise between the flexible and traditional class. In this class there are desks and tables with chairs (a traditional working environment) as well as flexible working stations. The classroom holds more sitting places than students, which allows changing places according to the needs. This way, during the course of a week, students may experiment working in “flexible” spaces, answering their needs and developing their selfregulation capabilities, while maintaining their habits to work, listen and study in a traditional workstation (desk and chair). Limits the impact on students going from a semi-flexible class to a traditional class. In order to facilitate learning and attention, let’s not forget about providing spaces for the students adapted to their size! No matter what type of class is chosen, it is important to make sure that students will have a work environment adapted to their anthropometric measures (sizes). As a matter of fact, attention and sitting posture are insured by postural control and the capacity of the child to have his feet flat on the ground, and use a work surface with an appropriate height, not too high and not too low. When possible, the student should be allowed to rest his back on a chair. 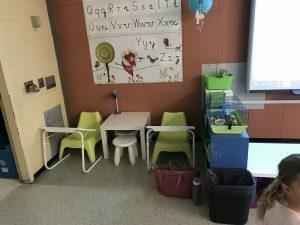 In this respect, no matter what type of class you are teaching (traditional, semi-flexible, flexible) it is essential for all students to have an adapted work space. To do so, flexible working stations should include seatings and tables with different heights. For example one working station could combine balls and wobbling stools of different heights. The work surface will equally be adjusted. This will create less harmonious working stations, but these will answer the specific needs of each student much better, which is the essence of the flexible class. This is an essentiel component for the success of a teacher wishing to make the transition to a flexible or semi-flexible class. Don’t focus on the aesthetic appearance of the class but on answering the students needs. You enjoyed this article? You wish to learn mnore? We offer different training sessions on this subject as well as support to succeed with your transition. You would like a consultation meeting with an ergotherapist to determine the best material for your class? Contact us! Thank you to Mme Ginette from l’école Providence in St-Jean-Sur-Richelieu for allowing us to use pictures of her successful class!